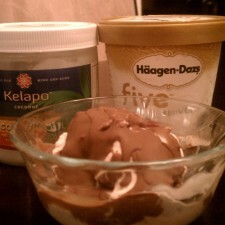 Thomas Keller created this delicious coconut oil recipe for chocolate shell ice-cream topping. This healthy recipe is simply made with chocolate and coconut oil, unlike the store bought kind that has a ton of ingredients including milk and soy. So if you are allergic to those this is a perfect topping for anything from ice cream to fruit! 2 tablespoons virgin coconut oil. Melt the chocolate in a small metal bowl set over a pan of simmering water. Stir in the coconut oil and heat until dissolved, about 1 minute. Keep the liquid lukewarm until ready to pour over the ice cream. 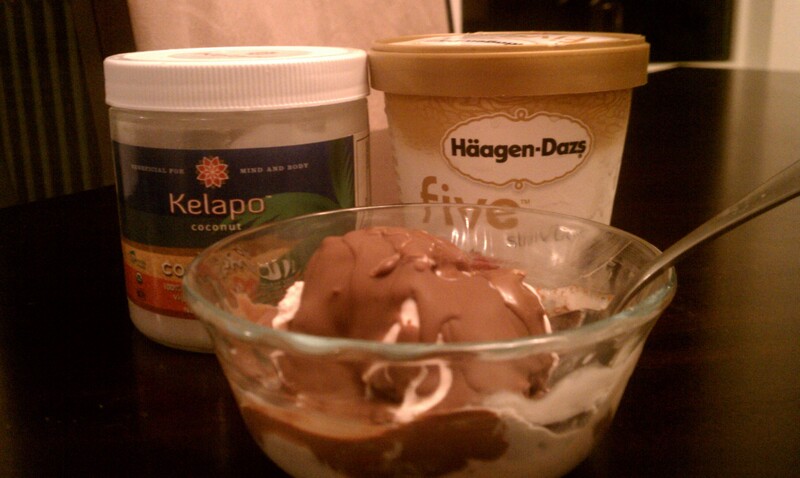 Chocolate will harden into a shell within a few seconds when spooned over ice cream. Yield: 3/4 cup (good for 4 to 6 scoops). Making magic shell is so easy!